Succulent plants make great, easy container garden plants. They are low-maintenance, beautiful and they come in stunning colors, many different sizes, textures, and shapes. Agaves are beautiful, striking and somewhat lethal, given their spikes, sharp tips, and potentially toxic sap. Despite their seemingly hostile appearance, they are fairly good-natured plants. They are not difficult to care for and are tolerant of cool temperatures. Though they prefer hot, full sun, agaves will tolerate some shade. 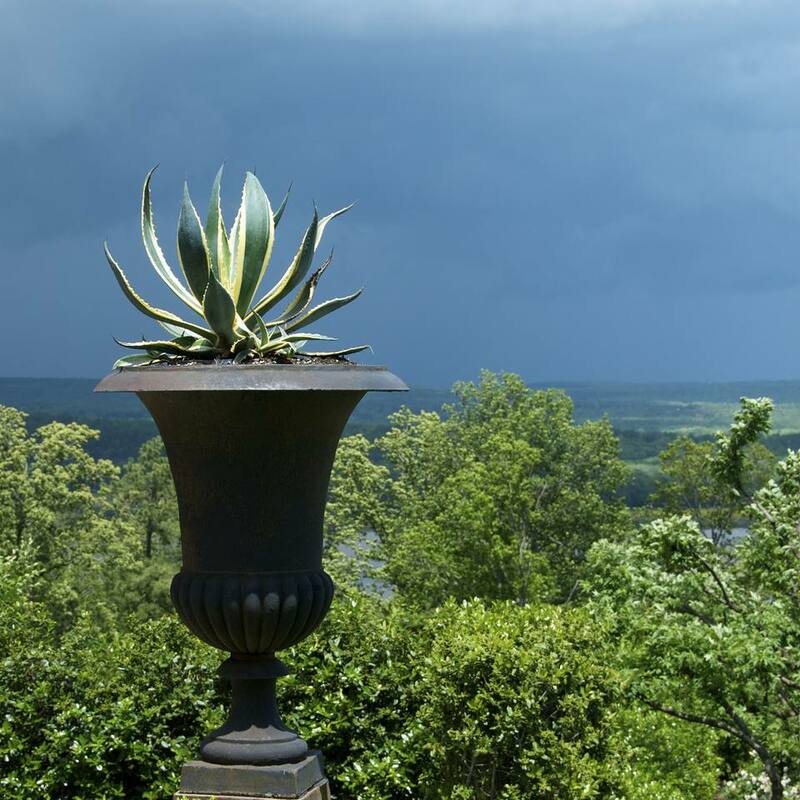 P. Allen Smith uses agaves to great dramatic effect. Potted in large, dark containers, they punctuate the landscape and add a modern, sculptural sensibility as well as vertical interest. These clamshells are packed full of succulent plants. They can be used for table decorations and make great house presents. You can use a mix of succulent plants, or use one type. These are planted with a few different kinds of hens and chicks, and some tiny echeverias. As when planting any succulent, use either a potting soil made specifically for succulents and cacti, or make your own by taking a good quality potting mix and adding either pumice or perlite. Make sure to use a container that either has drainage holes one that you can punch or drill holes in. Drainage is key to keeping your succulents healthy. To care for these miniature container gardens, give them full sun, or if you are in a very hot climate, keep them in partial shade. Do not over-water. During the growing season, keep the soil moist, but not wet. During the winter, when succulents go into dormancy, let the soil dry out between waterings. Hens and chicks are incredibly forgiving plants. They are extremely hardy—most of them can survive in ​zone 3 and can tolerate poor soil. You can plant succulents in almost anything. Because of their shallow root structure, you don't need a very deep pot. You do need good drainage though. For a lunch box container, take a large nail and hammer holes in the bottom of this box (so many that it looks like Swiss cheese). Because the metal is pretty thin, make sure to punch the holes with the metal sitting directly on the ground, so you don't bend the box. After punching the holes, line the box with plastic (also with holes), so it won't rust as quickly. Then fill it with a potting mix specifically designed for cacti and succulents. Pack the box full of plants, putting the ones that you know will drape, near the edges, and the larger plants near the back. The box can sit in full sun. Water it enough to keep the soil moist, but not wet. Bring it inside in the late fall and keep it in bright, indirect light. In the winter, let the soil dry out completely between waterings. Succulents can look great in almost anything—from a very formal container to one that is quite casual. These succulent plants are in a teacup that from a yard sale. You can find a whole set for a couple of dollars and then drill holes in the bottoms of the cups. For succulent plants, good drainage is essential. If you let them sit in water, succulents will quickly rot, so using a fast draining potting mix, and putting holes in your containers is the easiest way to keep your plants healthy. To drill holes in ceramics, you need a special drill bit and some patience. It takes a while to get through ceramics, and you have to let the bit cool down so that the heat doesn't build up from the friction and shatter your cup. Make sure to put your cup on a firm surface. You can place a rag or flat, thin sponge on a counter, or drill outside, on the ground so you don't have to clean up the dust. It's a good idea to wear safety goggles when doing any drilling, but particularly with ceramics which can shatter. After the holes are drilled, cut a small piece of plastic window screening and put it over the holes to keep the soil in and let the water out. You can also use​ a paper towel or a coffee filter. Then fill the cup, almost to the top, with a cactus and succulent potting mix, plant the succulents and gently water, giving enough moisture so that the soil is damp. Then let the soil in the cup settle and the succulent plants take root. What makes this succulent pot work so well is the spectacular concrete vessel, made by California artist, Mary Martha Collins. Mary crafts each pot by hand and then applies one of many stunning colors as a patina. This dish style of pot works particularly well with succulents because it is relatively shallow and succulents have a shallow root system. When planting a succulent garden, use a potting mix designed specifically for cactus and succulents, which you can buy at a nursery. The strong color of the pot which sets off the interesting colors of the succulent plants. If you over-water, some of the original plants may die. Simply pull them out and replace them with new plants. It's fun to stuff succulents in small containers. This vintage teacup and saucer was found at a second-hand store and cost a dollar. Use a ceramic bit on a drill to put several holes in the bottom of the cup, to ensure the good drainage that succulents need. Then fill the cup with succulent and cactus potting mix and then pack it with a mix of succulents. Water it infrequently, letting the soil dry out between waterings, especially in the winter. 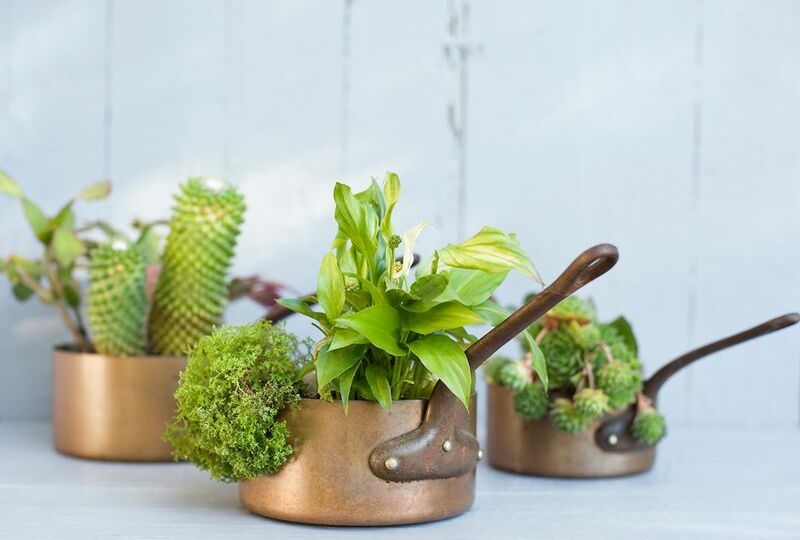 Even two small succulents in a tiny pot can make a big statement. These succulents are only about 2 inches tall and the pot is about 1 1/2 inches tall and 2 inches wide. What makes this tiny succulent pot really work is the topdressing of gravel—it gives it a finished look and marries the plants to the pot. While echeverias are rarely grown for their flowers, they can put on a spectacular display during the summer months. Echeverias are easy to grow succulents and they are spectacular. There are about 150 species of echeveria, with a wide range of colors and textures. Like all succulents, echeverias need fast draining potting soil and will rot if kept too wet. However, they don't like to be too dry either. They prefer bright light, though full sun can scorch them. Succulent plants look lovely in a strawberry pot. This is a medium-sized strawberry pot, and it holds lots of plants. Check the pot to see that it has drainage holes. Succulents don't like to be too wet. You can use a drill with a bit for drilling ceramics to add several large holes. Cover drainage holes. Use a piece of plastic window screening, paper towel or a coffee filter to cover drainage holes—anything that will keep soil in and let water out. Fill the strawberry jar with potting soil. Make sure to use either a potting mix that is designed specifically for succulents or add perlite or pumice to any good potting soil. Fill your jar, making sure that all the pockets are filled as well and then firm the soil gently. Plant succulents. Carefully take your plants out of their pots. If there is extra soil, you can gently take some off. Put your largest succulent plants in the top of the strawberry jar, making sure to plant them at the same level they were in their nursery pot. Fill the pockets with smaller succulents. Some succulents, like hens and chicks will root if placed on top of the soil. Water gently. Add water to your strawberry pot so that the soil becomes moist, not wet. You will want to make sure that the pockets get some water too. During the summer, keep the soil moist but not wet. If you live in a cold climate, bring your succulents inside to overwinter them and water only after the soil has dried out. Keep in bright indirect light. Most plants in this container were provided by Costa Farms. This old metal basket was found in a second-hand store. To create this container garden, soaked moss in water and then squeeze out the excess moisture. Line the basket with the damp moss. Carefully fill the basket with potting soil, making sure not to disturb the moss liner. Once the basket is filled with soil, take the hens and chicks out of the nursery pot and break them up. Planting hens and chicks is incredibly easy, you just need to push them slightly into the soil. Hens and chicks will thrive in full sun to partial sun and like to be protected from the wind. Water them when the soil dries and fertilize occasionally with a diluted liquid fertilizer or use a fish emulsion, seaweed combination. One of the great things about hens and chicks is that the hens, the larger rosettes, multiply rapidly, sending out chicks, smaller rosettes. You can either leave the chicks or break them off and easily transplant them. This is a teacup found at a yard sale. You can carefully drill a hole in the bottom using a ceramic bit, then cover the hole with a tiny piece of window screen. Fill the cup with potting soil and tuck the 'purple beauty' and 'red beauty' hens and chicks and houseleeks into the cup, making sure they have contact with the soil and will stay in place. This tiny container garden is only about 2 inches wide and 1 1/2 inch tall. It is packed with hens and chicks and a couple of echeverias. Purses to make easy hanging gardens. This is an example of using an unusual container for your succulent garden. For this one, an evening bag from a second-hand store was crammed full of succulents.